With its recent emergence on the West Coast showcasing professional jiu-jitsu on a grand platform “Fight To Win Pro” has taken the grappling world by storm. The show’s fight card features some of the elite rising and World Class talents of Brazilian Jiu-jitsu today. The event also features contestants from the MMA world looking to showcase their grappling skills on this premiere fight stage. 2013 marked a turning point in the career of Chad “Robo” Robichaux. After more than a decade long venture, Robo announced his retirement from professional Mixed Martial Arts. 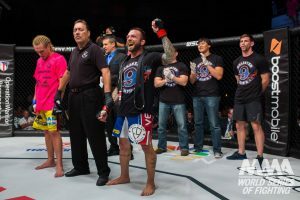 Hanging up the gloves, his departure from MMA did not deteriorate his passion for competing as there have been multiple sightings of the Force Recon Marine Corps Veteran combating in BJJ tournaments across Southern California. Robo looks to continue this inspiring momentum going into his next big grappling challenge. 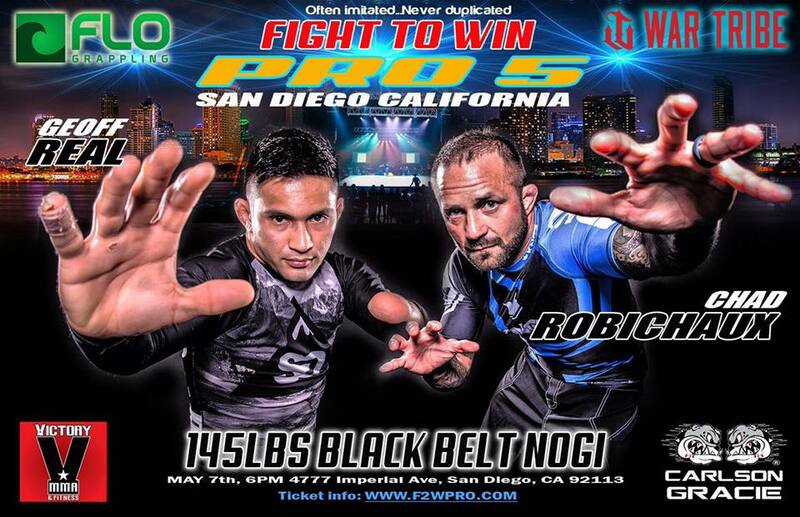 Robichaux will be back in one on one action under the bright lights of “Fight to Win Pro 5” in San Diego, California as he takes on Dean Lister Black belt/ EBI Veteran Geoff Real. MYMMANEWS had a chance to catch up with “Robo” as he seems very enthusiastic about the upcoming challenge ahead on May 7. Retiring from Mixed Martial Arts fighting, how has life been for you after your departure from the sport? Although retired from MMA with your recent grappling tournaments sightings, what motivates you to continue competing in combat sports? 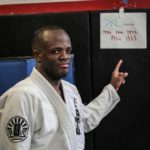 How does competing in a BJJ tournament differ from for a fight in MMA ? Following up on this statement how has your MMA experience helped with your grappling tournament preparation? On May 7th you will be competing at the “Fight to Win” grappling pro event. How did you get chosen for the card and thoughts on the opportunity competing in general? You will be up against Geoff Real in you grappling pro match. How are you training for the bout and what are your thoughts in regards to how you match against the EBI veteran? Obviously like your MMA fights the goal is always to come out victorious. Aside from coming away with the win, is there anything else you desire to achieve walking out of this experience? Finally how do you feel this groundbreaking event will aid in the growth of the Brazilian jiu-jitsu? Any final thoughts or people you would like to thank before we wrap up this interview? For more information on the event please visiting Fight to Win Promotions Facebook Page .